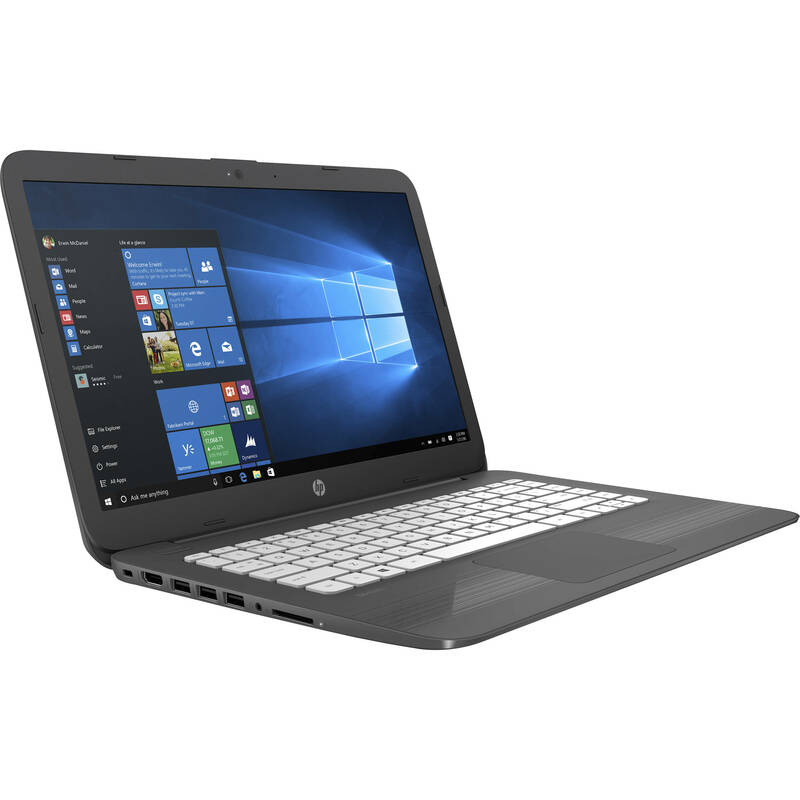 The smoke gray HP 14" Stream 14-cb160nr Notebook is a portable and lightweight notebook designed for users on the go. It's powered by a 1.1 GHz Intel Celeron N4000 dual-core processor and onboard 4GB of 2400 MHz DDR4 RAM that enables it to efficiently multitask and quickly access frequently used files and programs. When handling a heavier workload, the CPU can reach a burst frequency of 2.6 GHz. Its 14" SVA matte display, driven by integrated Intel UHD Graphics 600, has a 1366 x 768 resolution for crisp and clear HD content reproduction. Using the HDMI port, connect an external monitor for further functionality. For storage, this system is equipped with 64GB of eMMC flash storage. While it's not a lot, you can connect additional storage solutions via its multiple USB ports as well as its media card reader, which also can be used to quickly transfer files from mobile devices. Access the internet via 802.11ac Wi-Fi and pair compatible wireless peripherals via Bluetooth 4.2 technology. Other integrated features include a webcam, speakers, microphones, and a 3.5 mm microphone and headphone combo jack. The operating system installed is Windows 10 S, which is a slimmed down version of Windows 10 that can only utilize apps within the Windows Store. Windows 10 S is only capable of running Microsoft Store apps, ensuring that they're Microsoft-verified for security and integrity. Also, Microsoft Edge is the default browser for internet security, while Windows Defender keeps your system protected. Windows 10 S is optimized for performance, so you'll be able to boot and load applications quickly. Moreover, Microsoft's Edge browser runs fast and safe, so you can stream high-definition content and switch across multiple apps without delay. Even though Windows 10 S is a slimmed down version of Windows 10, you'll still have access to many of Windows 10's features, such as snap, task view, and virtual desktops. There's also Cortana, Windows Ink, and Windows Hello for password-free access. If there's something missing, head over to the Windows Store to search for the app that you need. Microsoft OneDrive is integrated with Windows 10 S, so you'll be able to save, access, and sync your files to the cloud. If you need certain tools or to run non-Store apps, you can easily upgrade to Windows 10 Pro. Box Dimensions (LxWxH) 19.3 x 12.0 x 3.0"